Obituary – Davis, Gertrude C. (Marshall) « Perry High School Alumni Association, Inc.
Former Perryan Gertrude (Marshall) Davis, 87, died at 5:30 p.m. Sunday, Nov. 22, 1998 at Maple Ridge South in Tulsa. Graveside rites will begin at 11 a.m. Wednesday at Grace Hill cemetery. Rev. Gary Halstead, son-in-law of Mrs. Davis, will officiate. Arrangements are under direction of Brown Funeral Home. 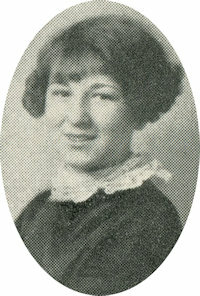 Mrs. Davis was born at Perry on Sept. 10, 1911. Her parents were Edward and Francesca Rahovitch Marshall. She was a graduate of Perry High School. In 1947, she and Paul C. Davis Jr. were married at Oklahoma City. She had worked as an administrative assistant at the capitol in Oklahoma City. Memorials may be made to the Oklahoma Medical Research Foundation for Alzheimer’s research. Survivors include two-daughters and sons-in-law, Marcia and Richard Marshall, Tulsa, and Paula and Gary Halstead, Tiffany, OH; three sons and daughters-in-law, Ed and Lana Jones, Ponca City, and Ben and Deborah Davis and Matt and Pam Davis, all of Oklahoma City; 16 grandchildren, 22 great-grandchildren and several nieces and nephews. In addition to her husband, Mrs. Davis was preceded in death by her parents, five brothers, three sisters and one granddaughter.